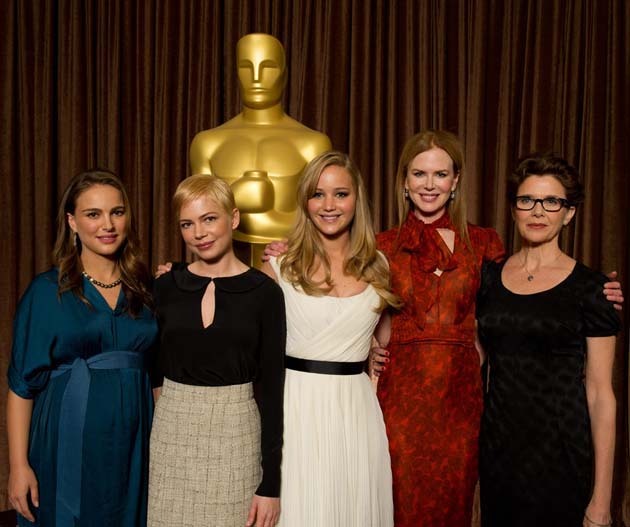 Best Actress Oscar group photo: Natalie Portman, Michelle Williams, Jennifer Lawrence, Nicole Kidman and Annette Bening. Cast: Mila Kunis. Barbara Hershey. Winona Ryder. Vincent Cassel. Benjamin Millepied. Cast: Aaron Eckhart. Two-time Best Supporting Actress Oscar winner Dianne Wiest (Hannah and Her Sisters, 1986; Bullets Over Broadway, 1994). Cast: Julianne Moore. Best Supporting Actor Oscar nominee Mark Ruffalo. Mia Wasikowska. Josh Hutcherson. Jennifer Lawrence is the only first-time nominee among this year's Best Actress contenders. Annette Bening had been previously nominated for Stephen Frears' The Grifters (as Best Supporting Actress, 1990), Sam Mendes' Best Picture winner American Beauty (1999), and István Szabo's Being Julia (2004) – in a role akin to Bette Davis' in Joseph L. Mankiewicz's All About Eve. Nicole Kidman was nominated for Baz Luhrmann's Moulin Rouge! (2001) and won for Stephen Daldry's The Hours (2002), in which she plays Virginia Woolf. Michelle Williams was a Best Supporting Actress nominee for Ang Lee's Brokeback Mountain (2005), in which she plays the wife of gay cowboy / sheepherder Heath Ledger. Natalie Portman was a Best Supporting Actress nominee for Mike Nichols' Closer (2004). Photo of Best Actress Oscar nominees Natalie Portman, Michelle Williams, Jennifer Lawrence, Nicole Kidman and Annette Bening: Todd Wawrychuk / © A.M.P.A.S. Best Actor Oscar nominees Javier Bardem, James Franco, Jesse Eisenberg, Colin Firth and Jeff Bridges. Javier Bardem for Alejandro González Iñárritu's Biutiful. James Franco for Danny Boyle's 127 Hours. Cast: Kate Mara. Amber Tamblyn. Jesse Eisenberg for David Fincher's The Social Network. Cast: Andrew Garfield. Justin Timberlake. Armie Hammer. Rooney Mara. Max Minghella. Joseph Mazzello. Colin Firth for Tom Hooper's The King's Speech. Cast: Helena Bonham Carter. Geoffrey Rush. Guy Pearce. Claire Bloom. Jeff Bridges for Joel and Ethan Coen's True Grit. Cast: Matt Damon. Josh Brolin. Hailee Steinfeld. James Franco, who will be co-hosting with Anne Hathaway the 2011 Oscar ceremony, and Jesse Eisenberg are first-time Oscar nominees. Colin Firth has one previous nomination, for Tom Ford's A Single Man (2009). Javier Bardem had been previously nominated as Best Actor for Julian Schnabel's Before Night Falls (2000) and won as Best Supporting Actor for Joel and Ethan Coen's No Country for Old Men (2007). Best Supporting Actor for Peter Bogdanovich's The Last Picture Show (1971). Best Supporting Actor for Michael Cimino's Thunderbolt and Lightfoot (1974). He won as Best Actor for Scott Cooper's Crazy Heart (2009). Photo of Best Actor Oscar nominees James Franco, Javier Bardem, Jesse Eisenberg, Colin Firth, and Jeff Bridges: Todd Wawrychuk / © A.M.P.A.S. Best Supporting Actress Oscar Nominees Helena Bonham Carter, Melissa Leo, Jacki Weaver, Hailee Steinfeld and Amy Adams. Helena Bonham Carter for Tom Hooper's The King's Speech. Cast: Colin Firth. Geoffrey Rush. Guy Pearce. Claire Bloom. Cast: Mark Wahlberg. Christian Bale. Leo's fellow Best Supporting Actress Oscar contender Amy Adams. Cast: Joel Edgerton. Guy Pearce. Ben Mendelsohn. Anthony Hayes. James Frecheville. Cast: Jeff Bridges. Matt Damon. Josh Brolin. Best Supporting Actress Oscar contenders Jacki Weaver, 63, and Hailee Steinfeld, 14, are first-time nominees. Helena Bonham Carter had been previously nominated in the Best Actress category for Iain Softley's The Wings of the Dove (1997). Cast: Linus Roache. Alison Elliott. Charlotte Rampling. Michael Gambon. Elizabeth McGovern. Ben Miles. Melissa Leo was a Best Actress nominee for Courtney Hunt's Frozen River (2008). Amy Adams has two previous Best Supporting Actress Oscar nominations, for Phil Morrison's Junebug (2005) and John Patrick Shanley's Doubt (2008). Junebug cast: Embeth Davidtz. Ben McKenzie. Alessandro Nivola. Celia Weston. Scott Wilson. Doubt cast: Meryl Streep. Viola Davis. Philip Seymour Hoffman. The 2011 Academy Awards ceremony will be held on Sunday, Feb. 27, in Hollywood. Among the other 2011 nominees in the acting categories are Colin Firth and Geoffrey Rush for The King's Speech, Jesse Eisenberg for David Fincher's The Social Network, Nicole Kidman for John Cameron Mitchell's Rabbit Run, and Natalie Portman for Darren Aronofsky's Black Swan. 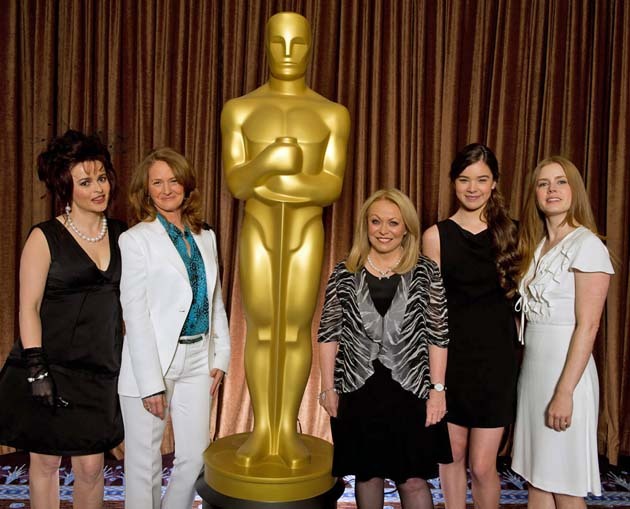 Photo of Best Supporting Actress Oscar Nominees Helena Bonham Carter, Melissa Leo, Jacki Weaver, Hailee Steinfeld and Amy Adams: Todd Wawrychuk / © A.M.P.A.S. Oscar Nominees Luncheon 2011 group photo: Annette Bening, Natalie Portman, Amy Adams and more. Annette Bening, James Franco, Jeff Bridges, Amy Adams, Nicole Kidman, Michelle Williams, Jeremy Renner, Natalie Portman, Jennifer Lawrence, Helena Bonham Carter, and Colin Firth were among the nearly 150 Oscar nominees gathered at The Beverly Hilton hotel in Beverly Hills on Monday, Feb. 7, '11, for the Academy of Motion Picture Arts and Sciences' annual Oscar Nominees Luncheon. The Oscar Luncheon was held in honor of all 2011 nominees and special award winners. Each one of them was handed an official certificate of nomination by Academy President Tom Sherak. Make sure to click on the photo above to enlarge it (4696 x 1800). Front, Row 1: Mitchell W. Block. Iain Canning. Helena Bonham Carter. Angus Aynsley. Simon Beaufoy. Stuart Craig. Rick Baker. Lisa Cholodenko. Stuart Blumberg. Nicole Kidman. Jeff Bridges. Annette Bening. Amy Adams. Trish Adlesic. Dana Brunetti. Darren Aronofsky. Ian Barnes. Jeff Cronenweth. Joel Coen. Craig Berkey. Ethan Coen. Colleen Atwood. Geefwee Boedoe. Row 2: David Parker. Ren Clyce. Michael Semanick. Randy Newman. Gary Gilbert. Celine Rattray. Jacki Weaver. James Franco. John Lasseter. Andrew Stanton. Sara Nesson. Mark Weingarten. Scott Franklin. Darla Anderson. Gary Rizzo. A.R. Rahman. Row 3: Mike Creagh. Stephen Trojanski. Glenn Slater. Gwendolyn Yates Whittle. Charles Ferguson. Debra Granik. Thomas Lennon. Chris Corbould. Mike Medavoy. David Seidler. Javier Bardem. Natalie Portman. Brian Oliver. Christopher Nolan. Todd Lieberman. Ed Novick. Tom Hooper. Lucy Walker. Pamela Martin. Jaime D'Cruz. Ruby Yang. Jennifer Lawrence. Jenny Beavan. Jennifer Redfern. Trent Reznor. Row 4: Aaron Sorkin. Michael Arndt. Lee Unkrich. Robert Stromberg. Karen O'Hara. Janek Sirrs. Scott Millan. Greg Orloff. Guy Hendrix Dyas. Scott Silver. Ken Ralston. Chris Sanders. Andrew Weisblum. Tim Hetheringtin. Sebastian Junger. Richard King. Nancy Haigh. Jess Gonchor. Jeremy Renner. Joe Farrell. Jesse Eisenberg. Geoffrey Rush. Tanel Toom. Tim Metzger. Row 5: Carey Villegas. Ben Snow. John Hawkes. Dean DeBois. Daniel Sudick. Alix Madigan Yorkin. Anne Rosellini. Wally Pfister. Emma Thomas. Addison Teague. Josh Fox. Angus Wall. Mark Stoeckinger. Roger Deakins. Greg P. Russell. Larry Dias. John Midgley. Michael Silvers. Skip Lievsay. Sean Phillips. Kirk Simon. Samantha Waite. Mark Ruffalo. Paul Franklin. Emile Sherman. Atticus Ross. Back, Row 6: Bryan Grill. Luke Matheny. Doug Mowat. John Powell. Eric Johnson. Adrien Morot. David Schaub. Paul Tamasy. Alan Menken. Hailee Steinfeld. Hans Zimmer. Peter Kurland. David Hoberman. David O. Russell. Mark Wahlberg. Melissa Leo. Teddy Newton. Jeffrey J. Haboush. Karen Goodman. Michael DeLuca. Dave Elsey. Gareth Unwin. Tom Myers. Yolanda Toussieng. Edouard F. Henriques. Gregory Funk. Kirk Baxter. Audrey Marrs. Mary Zophres. Keith Dorrington. Colin Firth. Michelle Williams. The 2011 Academy Awards ceremony will take place on Sunday, Feb. 27. Among the Best Picture nominees are Black Swan, True Grit, The Social Network, Inception, 127 Hours, The Kids Are All Right, and The King's Speech. Annette Bening, Natalie Portman, Amy Adams, et al. in 2011 Oscar Nominees Luncheon photo: Greg Harbaugh / ©A.M.P.A.S. Oscar Luncheon: Christopher Nolan ensconced between Wally Pfister and Hans Zimmer. Cinematographer Wally Pfister, director-screenwriter-producer Christopher Nolan, and composer Hans Zimmer can be seen above at the Academy of Motion Picture Arts and Sciences' 2011 Oscar Luncheon in Beverly Hills, on Monday, Feb. 7. Double nominee Christopher Nolan wrote and co-produced Best Picture nominee Inception. Nolan also directed the sci-fi thriller starring Leonardo DiCaprio, but failed to be shortlisted in that category. Two years ago, there was a major uproar when Nolan's blockbuster The Dark Knight, starring Christian Bale, Heath Ledger, Maggie Gyllenhaal, and Aaron Eckhart, failed to be shortlisted in the Best Picture, Best Director, and Best Adapted Screenplay categories. Ledger, however, received a posthumous Best Supporting Actor Oscar. The first film in Nolan's Batman trilogy was Batman Begins. Next in line is The Dark Knight Rises. Inception was nominated for eight Academy Awards. Both Wally Pfister and Hans Zimmer were also shortlisted. In addition to Leonardo DiCaprio, Inception features Marion Cotillard, Ellen Page, Tom Hardy, Joseph Gordon-Levitt, Michael Caine, Pete Postlethwaite, Cillian Murphy, Tom Berenger, Dileep Rao, and Ken Watanabe. 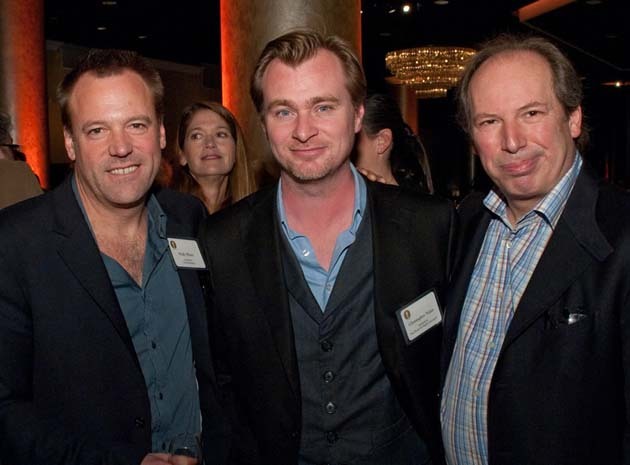 Photo of Wally Pfister, Christopher Nolan, and Hans Zimmer: Greg Harbaugh / © A.M.P.A.S. Oscar Luncheon: Christopher Nolan, James Franco, Natalie Portman and John Lasseter. James Franco, Christopher Nolan (behind Franco), John Lasseter, and Natalie Portman (seated) pose for the camera at the Academy's Oscar Luncheon. James Franco is a Best Actor contender for Danny Boyle's 127 Hours. Franco will also be an Oscar host alongside Anne Hathaway. Best Actress nominee Natalie Portman is in the running for Darren Aronofsky's psychological drama Black Swan. Portman was previously nominated in the Best Supporting Actress category for Mike Nichols' Closer (2004), co-starring Julia Roberts, Jude Law, and Clive Owen. John Lasseter is a nominee for the Toy Story 3 screenplay, which he co-wrote with Michael Arndt, Andrew Stanton, and Lee Unkrich. Lasseter has four previous Oscar nominations, in addition to winning for the animated short film Tin Toy (1988), shared with William Reeves. John Lasseter, Christopher Nolan, James Franco, Natalie Portman Oscar Luncheon photo: Richard Harbaugh / © A.M.P.A.S. Darren Aronofsky: Best Director contender signs autographs at Oscar Nominees Luncheon. Best Director Academy Award nominee Darren Aronofsky is seen above at the Academy of Motion Picture Arts and Sciences' 2011 Oscar Luncheon, held on Monday, Feb. 7, in Beverly Hills. Best Actress nominee Natalie Portman. Mila Kunis. Vincent Cassel. Winona Ryder. Barbara Hershey. Benjamin Millepied. Toby Hemingway. Ksenia Solo. Sebastian Stan. Kristina Anapau. Janet Montgomery. Mark Margolis. Tina Sloan. Sergio Torrado. Chris Gartin. Shaun O'Hagan. Kurt Froman. Black Swan received a total of five Oscar nods, including Best Picture. Natalie Portman – previously nominated as Best Supporting Actress for Mike Nichols' Closer (2004) – is easily the favorite for this year's Best Actress Academy Award. David Fincher for The Social Network. Tom Hooper for The King's Speech. Cast: Colin Firth. Geoffrey Rush. Helena Bonham Carter. Guy Pearce. Michael Gambon. Claire Bloom. Orlando Wells. Derek Jacobi. Jennifer Ehle. Eve Best. Timothy Spall. Anthony Andrews. Freya Wilson. Ramona Marquez. Adrian Scarborough. Simon Chandler. David O. Russell for The Fighter. Joel and Ethan Coen for True Grit. Cast: Jeff Bridges. Hailee Steinfeld. Matt Damon. Josh Brolin. Barry Pepper. Cast: Russell Crowe. Jennifer Connelly. Ray Winstone. Anthony Hopkins. Emma Watson. Logan Lerman. Douglas Booth. Kevin Durand. Leo McHugh Carroll. Marton Csokas. Gavin Casalegno. Voice: Nick Nolte. Mark Margolis. Cast: Mickey Rourke. Evan Rachel Wood. Marisa Tomei. Cast: Hugh Jackman. Rachel Weisz. Ellen Burstyn. Mark Margolis. Stephen McHattie. Cast: Ellen Burstyn. Jared Leto. Jennifer Connelly. Marlon Wayans. Christopher McDonald. Louise Lasser. Cast: Sean Gullette. Mark Margolis. Ben Shenkman. * The list of Darren Aronofsky movies was updated in June 2015. Photo of Darren Aronofsky signing autographs: Richard Harbaugh / © A.M.P.A.S. Jesse Eisenberg and Colin Firth: Best Actor competitors chat away at Academy's Oscar Luncheon. Best Actor Academy Award nominees Jesse Eisenberg and Colin Firth chat away at the Academy's 2011 Oscar Luncheon in Beverly Hills. Eisenberg was shortlisted for David Fincher's The Social Network. Firth, the odds-on favorite for the award, is in the running for Tom Hooper's The King's Speech. 2011 Oscar competitors Jesse Eisenberg and Colin Firth have something else in common: they have both been nominated for their portrayal of real-life characters: in The Social Network, Eisenberg is Facebook creator Mark Zuckerberg; in The King's Speech, Firth is the U.K.'s stuttering King George VI. Oscar Luncheon photo of Jesse Eisenberg and Colin Firth: Richard Harbaugh / © A.M.P.A.S.